7/28 Cup of Coffee: The Sea Dogs prevailed in the eighth annual Futures at Fenway, Henry Owens was rained out in Salem, while Brian Johnson was perfect for Greenville. Lowell pitched its way to another victory, anf the PawSox were beaten badly by the IronPigs. It was a forgettable night in Pawtucket, as the PawSox were pummeled by the Lehigh Valley IronPigs (PHI), 10-0. Chris Hernandez was roughed up, surrendering six runs in five innings, including four in the first inning. Clayton Mortensen could not stop the bleeding, allowing four runs in only two innings. Alex Hassan went 2 for 4 with a double, and Will Middlebrooks went 1 for 4 with a walk and two strikeouts. Dan Butler also went 2 for 4 to raise his average to .270. 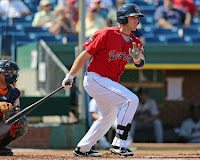 On a beautiful day at Fenway, the Portland Sea Dogs beat the Harrisburg Senators (WAS), 5-2. Keith Couch got the start, throwing seven strong innings. He limited the Senators to two runs on two hits, while walking two and striking out three. The Portland bullpen was able to protect the lead, with Miguel Celestino pitching a scoreless eighth and Matt Maloney pitching a scoreless ninth to get the save. Travis Shaw (pictured) was the star of the game, going 3 for 4 with a double and a home run into the bullpen in right field. Heiker Meneses put the Sea Dogs ahead in the second with a two-run double, and they never looked back. Garin Cecchini went 0 for 2 but he did draw two walks, while also showing off a solid glove at the hot corner. Salem was rained out on Saturday. The game will be made up in Salem on August 28. Brian Johnson continued to throw the ball well, tossing five no-hit innings to lead the Drive past the Lakewood BlueClaws (PHI), 4-3. It was Johnson's best start of the season, as he was perfect on the day. He struck out four and recorded seven ground outs. The perfect game was broken up in the bottom of the seventh with a leadoff walk, and the no-hitter fell later in the inning on a two-run triple. Tim Roberson hit a three-run double in the top of the seventh, and the Drive added an insurance run in the ninth on a Jose Vinicio single. That run proved to be crucial, as the BlueClaws added a run in the home half of the ninth, but Jeffrey Wendelken struck out the final batter to finish off his 10th save of the year. Vinicio went 3 for 5, while Roberson went 2 for 5. Lowell's pitching continued to impress, as the Spinners squeaked past the Connecticut Tigers (DET), 2-1. 2013 second-round pick Teddy Stankiewicz pitched two perfect innings, recording three ground outs and three fly outs. Sergio Gomez followed with 4 1/3 solid innings, allowing one run and striking out five. Joe Gunkel was dominant to finish the game, inducing a double play with two men on in the bottom of the seventh before setting down the last six batters of the game in order. He struck out four and improved to 3-0 on the season. Kevin Mager went 1 for 4 with a double, and Tzu-Wei Lin went 1 for 3 with a walk. Forrest Allday's RBI single in the top of the eighth proved to be the difference, as he drove in Nick Moore for the go-ahead run. The GCL Red Sox were also rained out yesterday. A 13-hit assault helped the DSL Red Sox cruise past the the DSL Athletics (OAK), 6-3. Juan Hernandez went 3 for 4 with a walk, while four other Red Sox batters had multi-hit games. Luis Alexander Basabe went 2 for 5 with a triple and a stolen base, and Victor Acosta went 2 for 5 with a double. Dedgar Jimenez was solid again, allowing one earned run in six innings, walking one and striking out four. Player of the Day: Travis Shaw's terrific day at Fenway was a bright spot in an otherwise disappointing season, as his line now sits at .226/.343/.408. With the first base position open long term for the Red Sox, Shaw entered the season with a chance to be in the discussion, but he has not played his way into the conversation. He has shown that he can go on hot streaks, as he did in the beginning of the season, but he has been inconsistent, leaving his ultimate future in doubt.